A big shakeout is materializing in Washington State’s recreational cannabis industry as businesses struggle to determine the ideal balance between supply and demand. From July 2014 through November 2015, licensed growers produced about 16,000 more pounds of marijuana than the amount retail stores sold, according to state data. That surplus equates to roughly two months of supply for the market, based on average cannabis sales through recreational shops recently. Since the rec industry launched in mid-2014, Washington’s newly licensed cultivators have produced more marijuana than rec shops sold every single month. 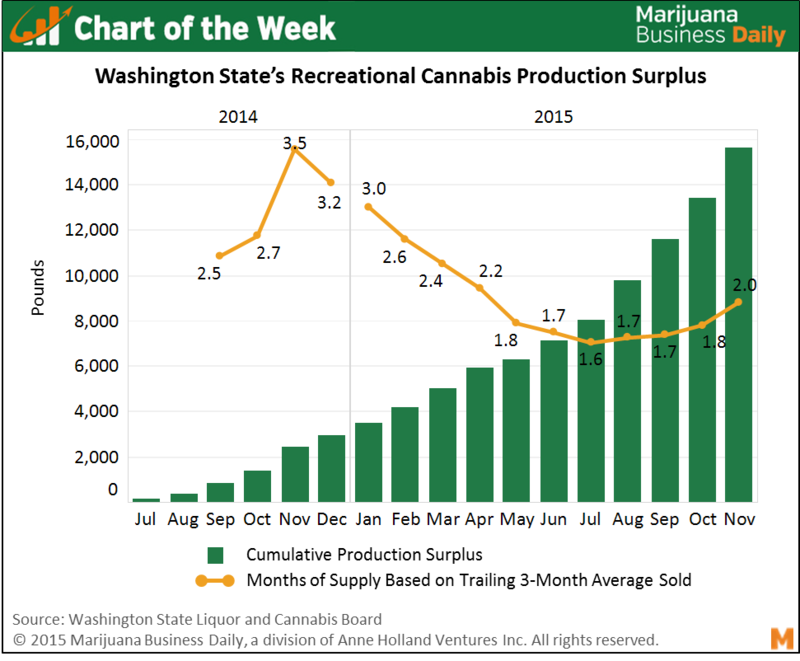 The cumulative production surplus stood at 850 pounds just three months after the first rec store opened – which equated to 2.5 months of supply – and has soared since then. A growing surplus for an entire market, not just an individual producer, can signal some big problems. In Washington, scores of cultivation companies have gone out of business in large part because of the oversupply issue, said Christopher Macaluso, a longtime cultivator in California who co-founded Canna Group, which provides consulting to cultivators in the northwest states. Producers are now sitting on a substantial amount of surplus inventory, and the future of many of them is in jeopardy. Some could try to unload low-quality inventory at fire-sale prices, flooding the market and exerting artificial downward pressure on the broader wholesale price. “If I was sitting on a surplus beyond a month and a half, I’d need to take a look in the mirror and either get more in tune with producing a higher-quality product, or I’d be taking a more business or corporate savvy approach to how I was pricing my product, looking at this from a long term play rather than a short term here and now,” Macaluso said. To be sure, the market saw higher levels of supply when compared to demand in the early days of the state’s rec industry. In November 2014, for instance, the market had 3.5 months’ worth of excess product. Supply is now more in line with demand, with the surplus currently running about 1.7 to 2 months. But the absolute cumulative surplus nevertheless continues to grow. “A lot of people really got into this for the money, with sort of hungry eyes, and aren’t able to produce the results that consumers, let alone the retailers, are looking for,” Macaluso said. This type of tumult is to be expected in large markets with a high number of producers, and Washington’s market will eventually find equilibrium and settle down. In the meantime, however, producers, processors and retailers will continue to face a high degree of uncertainty as the shakeout continues.